Then there was the day of the mushroom incident. I went to wash my hands and found a cluster of mushrooms rolling around in the bottom of the sink. I pushed them to one side, washed my hands and went back to whatever task I was set on for the day. Minutes later, the head chef (Joaquín) saw the mushrooms in the sink and started ranting and yelling, directing most of his displeasure at the poor underling chef who put them there. From what I gathered, they weren’t supposed to get wet. . . Oops. I can’t remember the last time I cooked a mushroom that wasn’t a Baby Bella. I like Baby Bellas—their substantial texture, their meaty taste, their cute name—but one recipe I made this week called for “mixed sliced fresh wild mushrooms.” I fully intended to buy a large package of Baby Bellas, but then, in the Trader Joe’s produce isle, I saw a three-variety pack with Oyster Mushrooms, Shitake Mushrooms and Crimini Mushrooms (the same as my Baby Bellas). I decided to give them a try. As I opened the package and started wiping off dirt, I had Post-Traumatic-Stress-Disorder-like flashes of memory. Okay, so I’m being dramatic. But I did stand a little straighter as I cleaned and sliced them. According to Alton Brown’s “Myth Smashing” episode of Good Eats, mushrooms only absorb a tiny bit of water if they’re washed or soaked. He recommends washing them like any other vegetable. But I like to think my culinary intern days were somewhat useful, and I learned the “don’t-mix-mushrooms-with-water” lesson the hard way. So I still wipe them off one by one with a damp paper towel like the Villa Real sous chef showed me. Geoff, my garde manger (salad chef) for that evening, surprised me by mixing up one of our favorite salads, Insalata Amalfitana (Amalfi Salad). 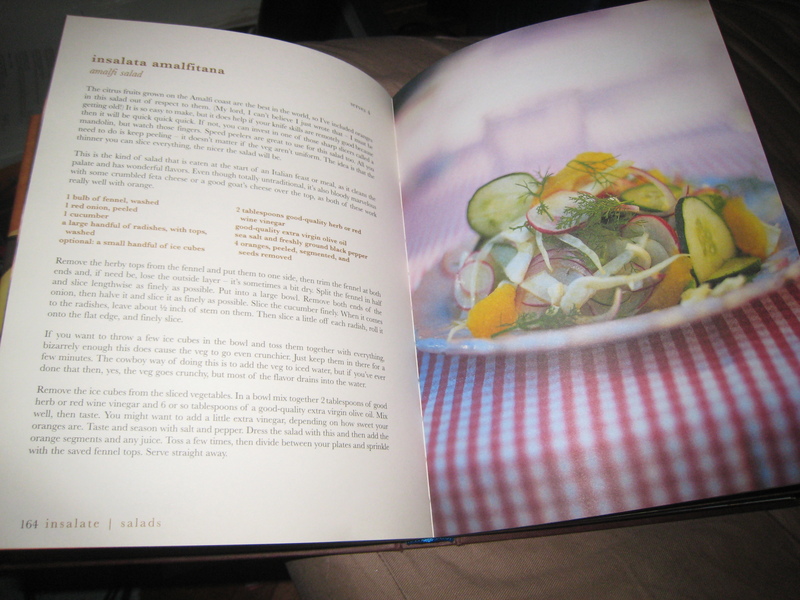 It’s from Jamie Oliver’s cookbook, Jamie’s Italy. The salad is light and simple—just thinly sliced fennel, onion, cucumber, and radishes thrown together with orange segments, dressing and herbs. I asked Geoff nicely to use his mandolin for the slicing, but he insisted on honing his knife skills. I jumped in to segment his oranges, and somehow dinner was done by about 9:00. This ragout recipe is not earth-shattering. In fact, I make a meat sauce like this regularly, minus the wine and mushrooms. I made this because of the polenta. The boiled corn meal has the consistency of solidified cream-of-wheat, a grainy, soft solid that tastes like home. I could eat it every day of the week and be a happy woman. Until I read this recipe, I didn’t even know precooked polenta was available, but next time I go to an Italian market I plan on buying more to experiment with. As for the mushrooms, I ended up enjoying the more delicate flavors and textures of the Oyster and Shitake mushrooms, along with the Baby Bellas. And the hearty polenta / ragout combination paired well with the acidity of the orange in Geoff’s crunchy fennel salad. Remove the herb-like tops from the fennel and set them aside. Then trim the fennel at both ends and take off the outer layer. Split the fennel in half and slice lengthwise as finely as possible. Put into a large bowl. Remove both ends of the onion, then halve it and slice it as finely as possible. Slice the cucumber finely into disk shapes. Leave the stems on the radishes as a grip. Then slice a little bit out of the side of the radish so it will be stable on the counter. Slice as finely as possible into disks. Throw a few ice cubes in the bowl and toss the salad with them for a few minutes. Jamie says that this makes the vegetables get crunchier. I’m not sure why it works, but it really does. I knew you could buy precooked polenta. Haha. Why can’t you mix mushrooms with water if they barely absorb water? That just doesn’t make sense. Oh well. That was a funny story.